Join us for the Lorton Lounge Lunch Ride Sunday April 14th. Meet at Frontier 12:15 PM, KSU at 12:30! Click HERE to download the 2018 Mileage Winners as a PDF! We are posting up the dates of the events that we know about for the New Year. Most are firm. A few could change as stuff happens. Your "World's Greatest Webmaster" will add in details, times, etc as they become available. We hope this helps with your long range planning! Renew Your 2018 Chapter Dues NOW! Don't miss the many opportunities come with being a member, and its still only $20 BUCKS cheap! 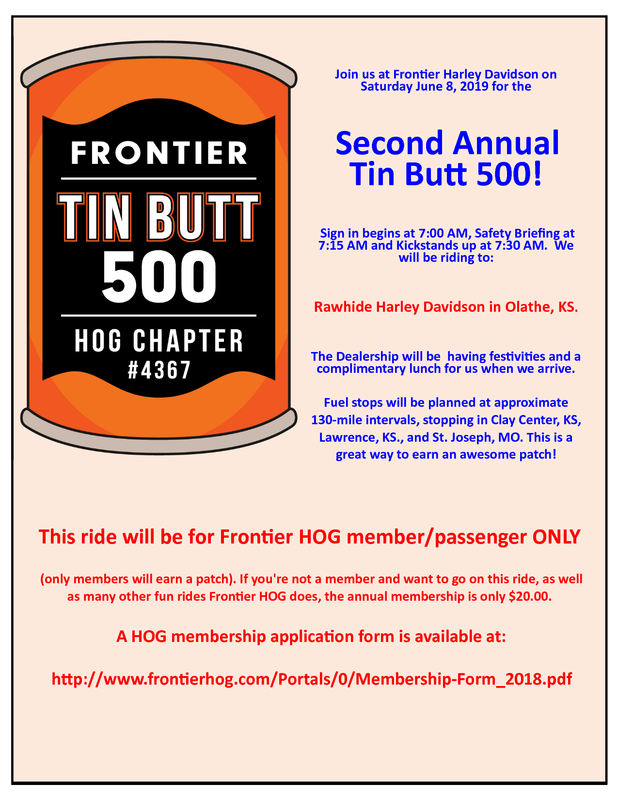 click "Printable Membership-form" Bring or Mail to: Frontier H-D, Attn: H.O.G. 205 NW. 40th Street Lincoln, NE. 68528. Second Membership ID Card Available for only $5.00. Only One Name per Membership Application. 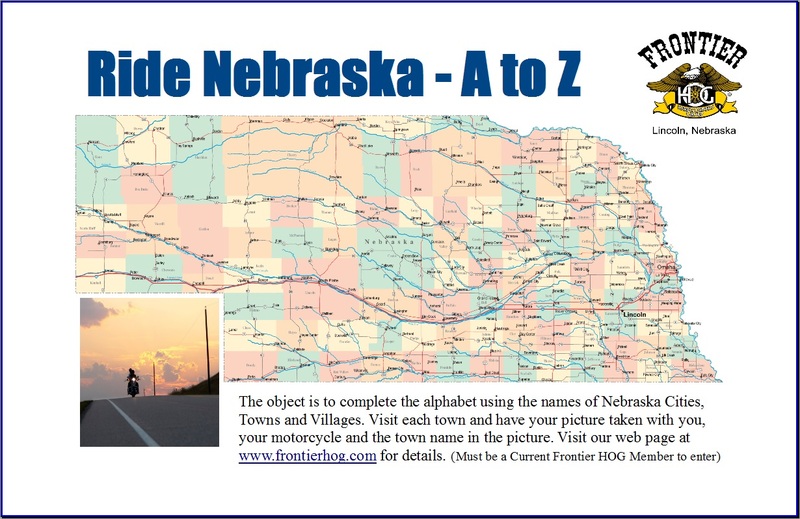 Click Here to download the Ride Nebraska A to Z Instructions and form! Begin your journey today! 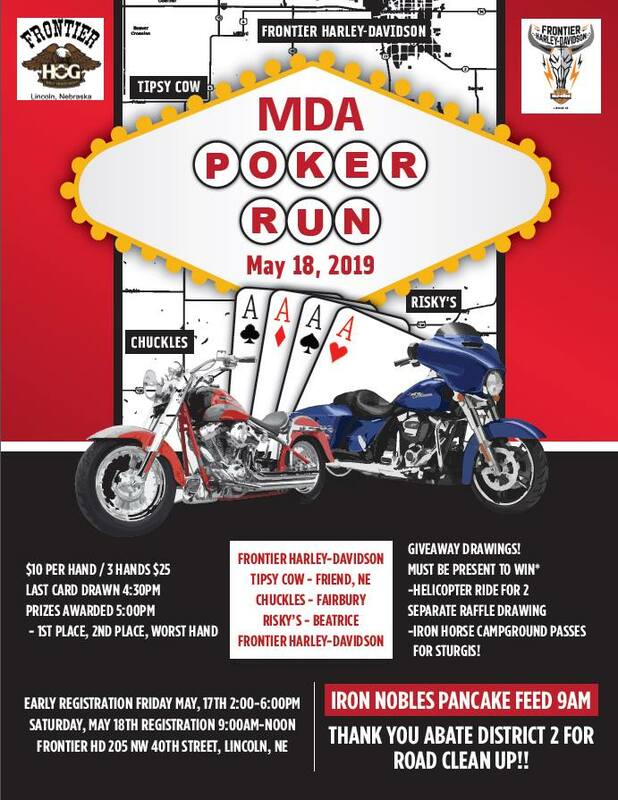 Click Here to download the 2018 Blazing Saddles Poker Run Flyer! 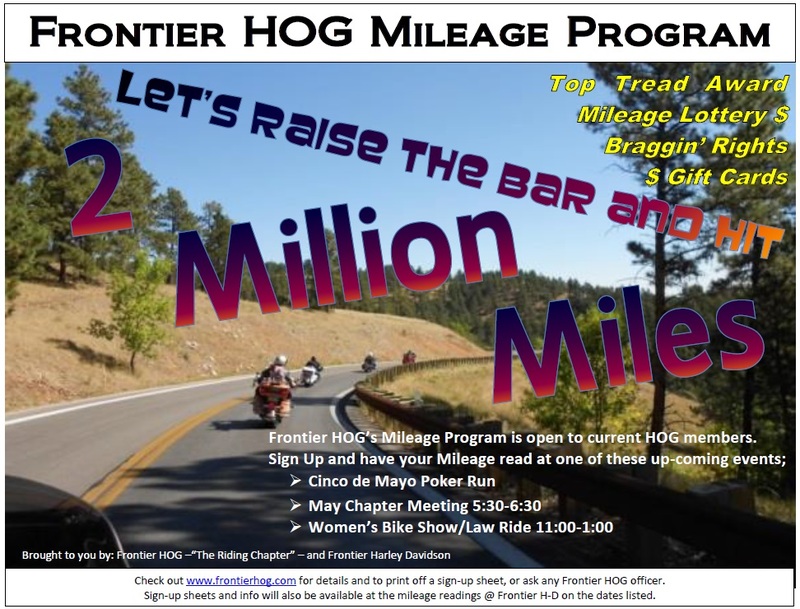 As a large and very active chapter, Frontier HOG along with Frontier H-D conducts many events and activities through out the year. 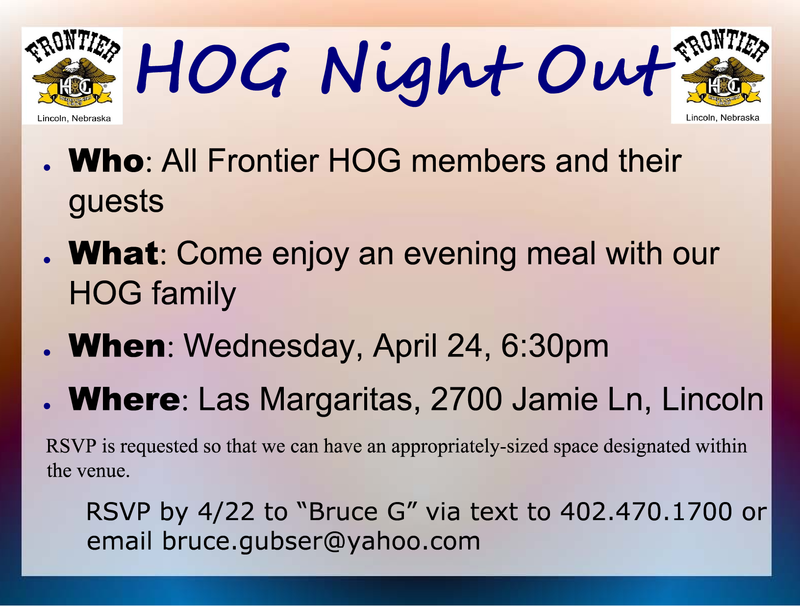 You can e-mail webmaster@frontierhog.com with any suggestions you may have. Round Ups are our Monthly meetings that are the first Tuesday of the month. 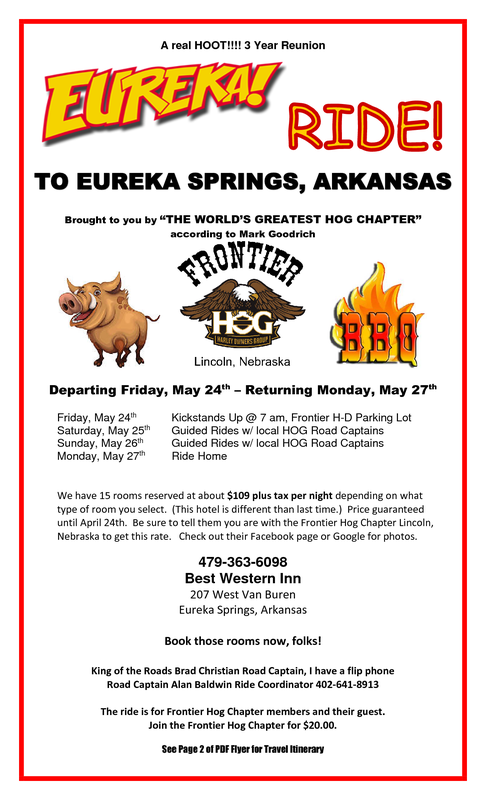 They are held at the HOG Pen located at Frontier Harley-Davidson. The social time starts at 5:30 and dinner starts at 6:00 pm. The meeting starts at 6:30 and last about 1 hour. 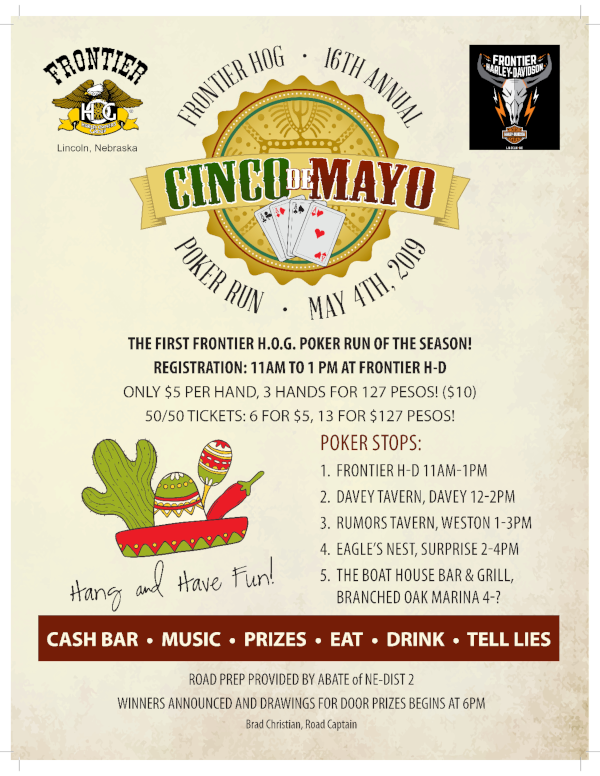 Breakfast and Dinner rides will start at Frontier H-D. Try to be there 15 minutes early for the pre-ride instructions...full of gas and an empty tummy! Breakfast rides; kickstands up at 8:00 am unless otherwise noted. Dinner rides; kickstands up at 6:00 pm. 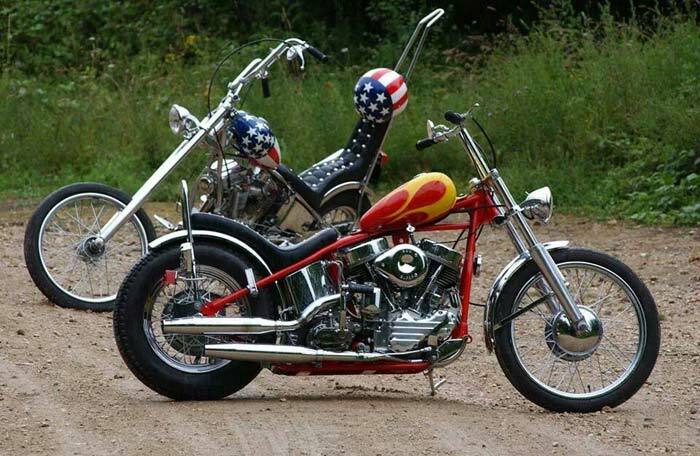 Ride, Have fun, Be Safe, Keep the Wind in your Face!